There are about 4433 exoplanets in the latest catalogs. Their radii have generally been measured by knowing the radius of their host star and then closely fitting the lightcurves as the planet transits across the face of the star. The radius of the host star is thus a key parameter and latest data release of the Gaia mission has enabled astronomers to improve the accuracy of stellar properties in its catalog very significantly – to a precision in radius of about 8% – for nearly one hundred and eight thousand stars in the Kepler exoplanet fields. CfA astronomer Dimitar Sasselov was part of a team with three colleagues to use the new stellar results to refine the radial measurements of 4268 exoplanets. 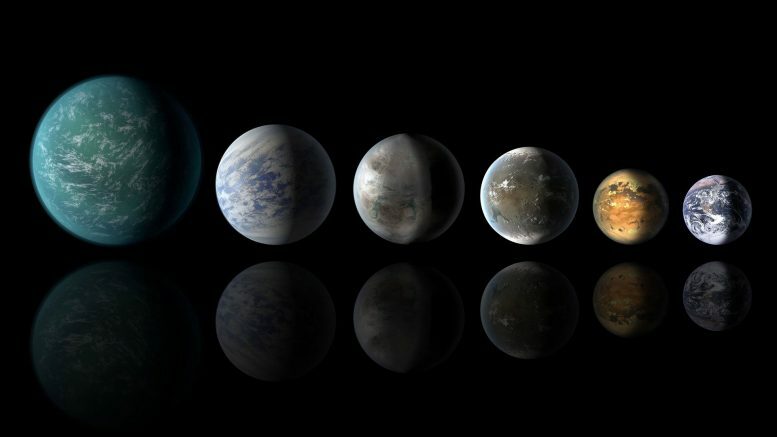 The large dataset and refined values enable the scientists to confirm some previous hints about the distribution of exoplanet sizes, namely, that the size distribution is not exactly uniform but rather some exoplanet sizes are less common than might be expected. In particular, there is a paucity of planets with radii slightly larger than about two Earth-radii, and other slight decreases again at sizes of about four and about ten Earth-radii. The astronomers use their new database to define a new classification scheme for exoplanets. The smallest category consists of planets smaller than four Earth-radii, and within this group are two subgroups: those smaller than two Earth-radii and those between about two and four Earth-radii. These small planets are generally gas poor. The second category has between four and ten Earth-radii, and the team proposes they be called “transitional planets” since they form a bridge between the small class and the large gas giants. There is a relative paucity of objects in this class for reasons that are not well understood. The third new grouping contains the gas giant planets, those with sizes larger than about ten Earth-radii and which are dominated by hydrogen and helium; these include Jupiter analogs, and even brown dwarf stars. The authors conclude by observing that the group of two-to-four Earth-radii planets are the ones most likely to have water- rich cores (“water worlds”). They propose that their results will help refine the list of objects selected for observational follow-ups including potentially habitable worlds. Reference: “Survival Function Analysis of Planet Size Distribution with GAIA Data Release 2 Updates,” Li Zeng, Stein B. Jacobsen, Dimitar D. Sasselov, Andrew Vanderburg, MNRAS; 479, 5567, 2018. Be the first to comment on "Gaia Mission Helps Improve Classification Scheme for Exoplanet Sizes"